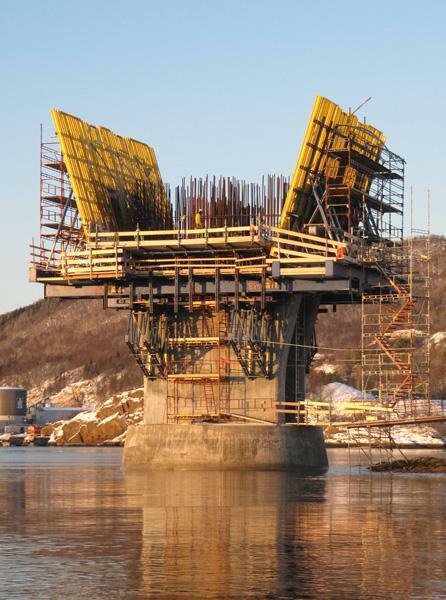 Tailor-made Doka formwork solutions are ensuring swift, safe progress during construction of the Tverlandsbrua bridge between Løding and Vikan in the Nordland region of northern Norway. Among the unusual challenges of this project are the high seas encountered out on the fjord, with waves up to 10 m high putting the technicians and the site team severely to the test. The Norwegian construction firm Reinertsen is erecting a new bridge between Løding and Vikan in northern Norway, for the Rv 80 trunk road. This Trondheim-based company decided to work with Doka because of the positive experience it had had on previous projects: In fact, the extensive advisory and planning services and high safety standard provided by Doka were crucial factors underlying the decision. The Rv 80 road-building project aims to link the Tverland peninsula better to the regional capital of Bodø – some 1200 km north of Oslo. The Tverlandsbrua is 670 m long, has a longitudinal gradient of as much as 4.5 %, and is being built in the form of a spiral transition curve with varying radii. It crosses the Saltfjord between Løding and Vikan, in seven spans borne by six piers of up to 13 m in height – three of them are twins. Doka has four of its Cantilever forming travellers (CFTs) in action at this site. Because of the large – 22.6 m – width of the superstructure deck, they are built with three longitudinal trusses, from rentable components. The slanted webs made it necessary to widen the bottom formwork; this, in turn, meant that the bottom grid – including the platforms – had to be slide-mounted. 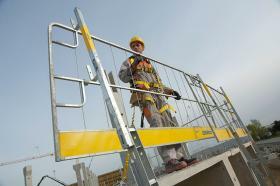 In this way, the site crew can adapt the bottom formwork to the next segment quickly and safely. The modular design concept of the CFTs also makes for efficient, cost-saving adaptability to the different cross-sections of the superstructure deck. When it came to building the three bridge piers from which the CFTs were to start travelling, an exceptionally strong formwork solution was needed: In stormy weather, the up to 10 m high waves out in the fjord put the equipment fielded here through an absolute endurance test – which the Large-area formwork Top50 and Wall formwork FF20 systems used in building these piers passed with flying colours. The twin piers were each poured in a single casting step. To stabilise the formwork, platforms were built onto the foundations beneath the piers; the high wind loads were then transferred into these platforms by spindle struts. CFT beams (from the cantilever forming travellers) and SL-1 system beams were used in constructing the platforms. This equipment was also used to help construct the pier-heads – a custom solution that has worked very well indeed: The beams rested on horizontally mounted Doka supporting construction frames, enabling them to sustain the load from the widely cantilevering pier-heads. The pier-heads were poured in three casting steps: Large-area formwork Top 50 was used to form the bottom slab, Large-area formwork Top50 and Wall formwork FF20 to form the webs, and the Bridge formwork ParaTop, Large-area formwork Top 50 and Load-bearing tower Staxo systems to form the deck slab. Using ParaTop meant that no shoring was needed for the cantilever arm formwork – which also kept the equipment commissioning-quantity small. A particular challenge here was that it had to be possible to lower the screwjack mechanisms after the first casting segment, so that the bottom slab could carry its own weight: this meant that when the webs were poured, it was already possible to transfer the load into the piers by way of the bottom slab. 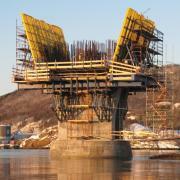 Can support one-sided walls up to a height of 42' - 0"
Thank you for your interest - High seas in the Norwegian Arctic. Thank you very much for your interest - High seas in the Norwegian Arctic.